1. Add 1 tablespoon of oil to a skillet over medium heat. When hot, add the garlic and sauté until lightly browned. Add the onion and sauté until translucent. Add the pork and sauté for about 5 minutes, or until cooked. Add the salt, fish sauce, and pepper. Transfer the mixture to a large bowl and set aside. 2. Add the remaining tablespoon of oil to the same skillet over medium heat, and sauté the bamboo shoot, carrot, and cabbage for 5 minutes or until cooked. Add to the reserved pork mixture and stir to combine. Set aside to cool. 3. Set a wrapper on a flat surface and place a lettuce leaf in the top center of it, allowing about 1½ inch of the lettuce leaf to extend beyond the top of the wrapper. 4. Place about 1 to 2 tablespoons of the pork and vegetable mixture in the middle of the lettuce. Fold the bottom part of the wrapper over half of the filling and then fold the ends toward the middle. Secure the roll using a toothpick. 5. For Sweet Garlic Sauce, combine the garlic, sugar, salt, soy sauce, vinegar, and water in a saucepan, and bring to a boil. Reduce the heat to low and add the cornstarch mixture. Stir until thickened, and remove from the heat. 6. 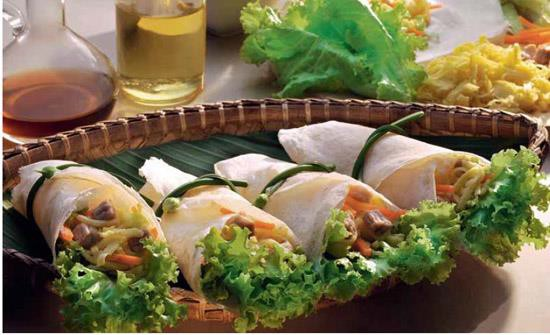 To serve, pour Sweet Garlic Sauce on a roll and top with crushed peanuts.